My two grandchildren are entering those tween years. Aubrie is 13 going on 30 and Carter is 12 going on 20. Actually they both are great kids. I totally adore these two. They’ve made me laugh and have made me cry. I would do any thing and I mean anything for these two. We’ve gone on zombie rides late in the evening in an old white truck, down dark dirt roads (I sincerely hope they remember those rides when they get older). We have an area on our property named zombie lake. Actually its just a stream running through the property. They love splashing through the water in the back of that old truck. Aubrie still insist on the safari rides and I’m sure it’s more for our benefit than hers. Aubrie loves horses and we’ve told her when the time was right she would get that horse. Well she has saved her birthday and Christmas money and has bought every tack you can think of for a horse. Finally we found one just like she was looking for and she is a beauty. 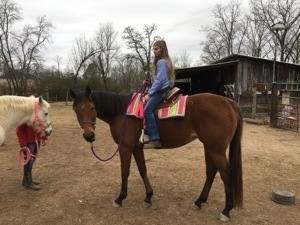 she had saved enough money to buy this horse so my husband took her out to see the horse and guess who came home with a horse?